Total employment in the Greater Regina Area was up 0.5% or 700 positions in January to March 2019 over the same period in 2018. At the provincial level, year-to-date employment increased by 8,833 or 1.6%. Year-to-date employment in March 2019 was up over the same period in 2018 in Agriculture (533), Resource Extraction (267), Utilities (433), Transportation and warehousing (2,033), Educational services (2,000), Health care and social assistance (833), Accommodation and food services (800), and Other services (567). Year-to-date employment in March 2019 was down in Manufacturing (-933), Wholesale and Retail Trade (-767), Finance, insurance, real estate and leasing (-1367), Professional, scientific and technical services (-1200), Business, building and other support services (-733), Information, culture and recreation (-633), and Public administration (-200). February 2019, total year-to-date housing starts are down by -364 units or -82.0%. All categories of starts saw year-to-date declines: Singles (-28 units or -43.8%), semi-detached (-8 units or -57.1%), row (-24 units or -63.2%), and apartment and other types (-304 units or -92.7%). February 2019 year-to-date building permits are down -35.5% over the same period in 2018. Declines were widespread and occurred across all sub-sectors: Residential (-29.4%), industrial (-95.8%), commercial (-15.5%), and institutional and governmental (-77.1%). The average year-to-date Housing Price Index Benchmark Price is down from $277,067 in March 2018 to $264,500 in March 2019. In 2018, with the pace of GDP growth at the national level suggesting that the economy is operating at close to full capacity, the Bank of Canada raised the overnight rate by 0.25% to 1.75% on October 24, 2018, the highest rate since December 2008. However, the Bank of Canada held the rate at this level in March 2019 citing uncertainty stemming from a sudden and unexpected deceleration in GDP growth in the final quarter of 2018. The next rate announcement is April 24, 2019. 2018 Regina Census Metropolitan Area population was up 2.3% over 2017 to 257,337 on the strength of international and intraprovincial migration. This can be expected to continue through 2019 with continued employment growth spurring further inmigration. The Conference Board of Canada forecasts Regina’s economy to post a 2.1% real GDP gain in 2019, following a 2.2% increase in 2018. The latest population counts show that Greater Regina Area (GRA) 2018 population was up 2.3% over 2017 to 257,337 on the strength of international and intra-provincial migration. Total average year-to-date employment in the GRA was down 0.05% or 67 positions in 2018 over 2017. At the provincial level, 2018 employment advanced by 2,367 or 0.4%. Employment growth was positive in 2018 in Utilities, Construction, Transportation and Warehousing, Finance, Insurance, Real estate and Leasing, Business, Building and Other support services, Educational services and Other services. Employment in 2018 was down in Agriculture, Resource extraction, Manufacturing, Wholesale and Retail trade, Professional, Scientific and Technical services, Health care and Social assistance, Information, Culture and Recreation, Accommodation and Food services, and Public administration. The unemployment rate remains relatively low at 5.9% up from 5.1% in 2017. 2018 building permits were down 21.5% from 2017. Most sub sectors posted decline with only industrial permits showing an increase. Total housing starts in the GRA in 2018, at 1,139 units, were down from 2017 by 40.8% with declines in all classes of starts: single detached, semi-detached, row houses, and apartment units. The following report is a short synopsis of some key factors influencing the GRA’s economy, and a look into how they performed in 2018. Labour Market Key among the labour market indicators is the change in the total number of people employed in the GRA. With a year-over-year drop of 1,700 positons in December 2018, total average year-to-date employment in the GRA was down 0.05% or 67 positions in January to December 2018 over the same period in 2017. At the provincial level, year-to-date employment advanced by 2,367 or 0.4%. Within the strategic sectors in the GRA (resource extraction, metal fabrication, machinery manufacturing, finance and insurance, agribusiness, and tourism) employment growth was muted. Only Finance, Insurance, Real estate and Leasing was up over 2017 (392). Year-to-date employment in December 2018 was also up over the same period in 2017 in Utilities (125), Transportation and Warehousing (267), Business, Building and Other support services (1,383), Educational services (1,783), and Other services (217). Construction, primarily a supporting sector, saw employment bounce back in 2018 after a weak performance in 2017. 2018 construction employment was up by 1,400 positions from 2017 mostly on the strength of non-residential construction. Employment in 2018 was down Agriculture (-317), Resource Extraction (-750), Manufacturing (-983), Wholesale and Retail Trade (-867), Professional, scientific and technical services (-1,292), Health care and social assistance (-900), Information, culture and recreation (-225), Accommodation and food services (-133), and Public administration (-200). The 2018 unemployment rate, although still relatively low at 5.9%, increased from 5.1% in 2017. Driving the decrease was the addition of 1,300 persons to the ranks of the unemployed. At the same time there was a small drop in the participation rate (total employed and unemployed expressed as a percentage of the population aged 15 years and over), which dropped slightly from 72.4% to 71.7% as it did not keep pace with the growth in the population aged 15 and over. Advances in the number of unemployed reflects that the GRA is not experiencing a â&#x20AC;&#x153;discouraged workerâ&#x20AC;? effect and/or significant out-migration to balance the labour market. A discouraged worker is a person of legal employment age who is not actively seeking employment or who does not find employment after long-term unemployment. This is usually because an individual has given up looking or has had no success in finding employment. Construction Construction activity the GRA in 2018 was mostly negative. However, the construction industry, saw employment rebound in 2018 after a weak performance in 2017. 2018 construction employment was up by 1,400 positions from 2017 mostly on the strength of non-residential construction. A city building permit is needed to construct, demolish, build an addition or renovate a building. The City issues the permit and reviews plans to ensure they comply with all current building codes, bylaws and other applicable regulations. Building permits, also a leading indicator of construction activity, were down -21.5% over 2017. The only sub sector that posted an increase was industrial (182.9%). During the same time period Residential (-28.4%), Commercial (-28.6%), and Institutional and governmental (-57.6%) posted declines. New housing starts are a good indicator of a regionâ&#x20AC;&#x2122;s economic health. New housing has a powerful multiplier effect through the economy and is typically used to derive estimates for other consumer-based indicators. People buying new homes also spend money on other consumer goods such as furniture, lawn and garden supplies, and home appliances. Total housing starts in the GRA in 2018, at 1,139 units, were down from 2017 by 784 units of -40.8%. Declines were widespread across all classes of starts: single detached, semi-detached, row houses, and apartment units as the market grappled with over supply and stricter borrowing rules. Outlook for 2019 According to the Conference Board of Canadaâ&#x20AC;&#x2122;s Winter 2018 Metropolitan Outlook, Reginaâ&#x20AC;&#x2122;s real GDP grew 2.2% in 2018 and will grow a further 2.1% in 2019 after rising 2.3% in 2017. Employment will increase by 1.5% in 2019, following a 0.8% gain in 2017 and a flat 2018. The Conference Board also expects that the unemployment rate will dip to 5.4% in 2019. With a forecasted 2% increase in population in 2019, more than twice the 30-year average and well above the national average, the Conference Board forecasts total housing starts to bounce back to the 1,700 range as the market finally absorbs the 2017 building spree. 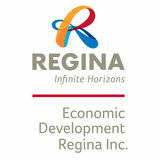 Economic Development Regina Inc. (EDR) is the economic development agency for the Greater Regina Area (GRA). Praxis Consulting is Saskatchewanâ&#x20AC;&#x2122;s largest locally-based management consulting firm. EDR is a not-for-profit economic development corporation, governed by a volunteer board of directors. EDR provides leadership to the community to support industry growth and diversification through retention and expansion of existing business and encouraging investment, development of industry and tourism. In collaboration with key stakeholders, we work to identify, develop and promote opportunities that advance economic prosperity and ensure the GRA offers a vibrant and diversified economy for investors, is a positive destination experience for visitors and offers a high quality of life for residents. Strategy: Thought-leadership, rigorous planning, and pragmatic strategies. Research: Information gathering and data analytics. Results: Cascading strategy and culture within the organization. 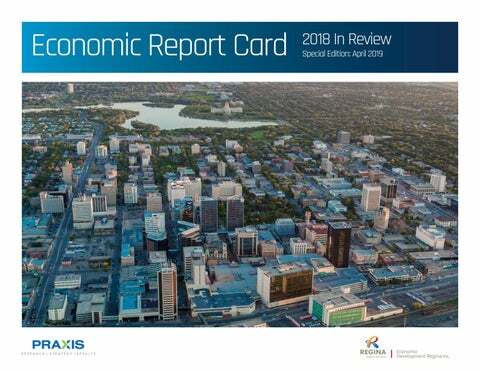 April 2019 edition of the Economic Report Card for the Greater Regina Area. Including a special report of 2018 in review.